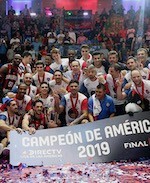 Regatas Corrientes overcame Estudiantes to secure their Final Four appearance. Fabian Ramirez (193-F-90) delivered 14 points and 8 rebounds to lead the effort. Regatas Corrientes accumulated a 46:37 halftime lead. Regatas went on a 24:8 run in the third term to clear off for good. Paolo Quinteros (188-SG-79) and Gerald Fitch (191-G-82, college: Kentucky) had 12 points each for Regatas. Jasiel Rivero (204-C-93, agency: Pro Sports) netted 9 points and grabbed 5 rebounds in the loss. Bauru rallied past Guaros for 1-1 record in Group F. Rafael Hettsheimer (206-C-86) delivered 24 points and 8 rebounds to pace the winners. Bauru eked out a 42:41 lead at the interval. They sank 25 points in the fourth period to get away with a tough win. Alex Garcia (191-G-80, agency: Interperformances) produced 16 points, 8 rebounds and 8 assists for the winners. Heissler Guillent (186-PG-86) replied with 21 points for Guaros.